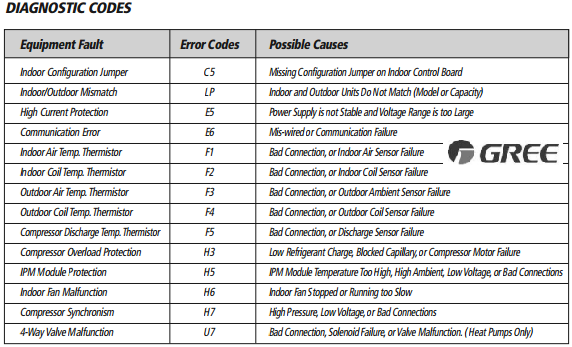 The fault code is deduced from the number of times the green LED flashes, blocking unit operation. 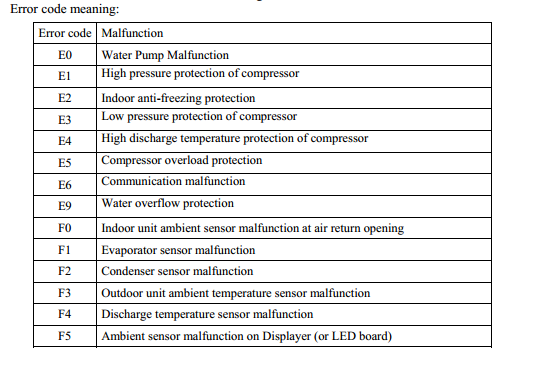 F1: Malfunction of indoor ambient temperature sensor:Check if indoor room temperature sensor is connected properly. F2: Malfunction of evaporator temperature sensor:Check if the evaporator temperature is connected properly. 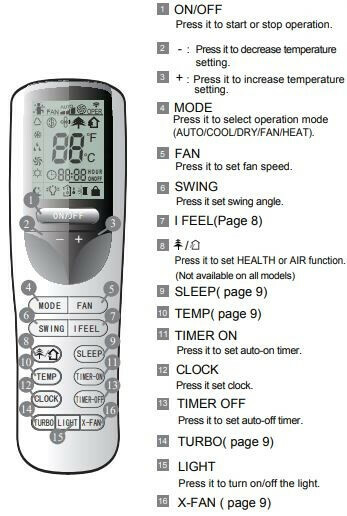 H6: Indoor fan block:Check if terminal of the indoor motor is connected properly. Replace the fan motor or the indoor board if disabled. 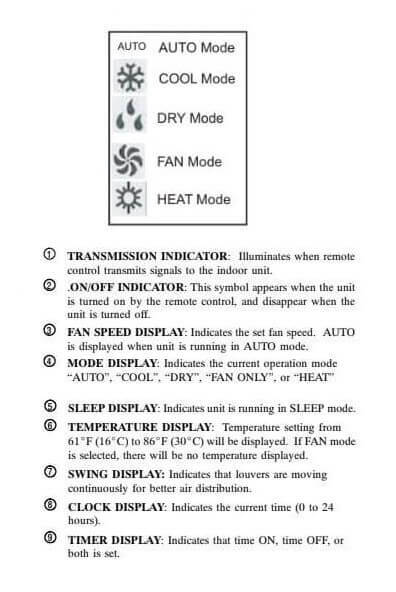 A/C Status: The unit will stop operation as it reaches the temperature point. During cooling and drying operation, compressor stops and indoor fan operates; During heating operation, the complete unit stops operation. 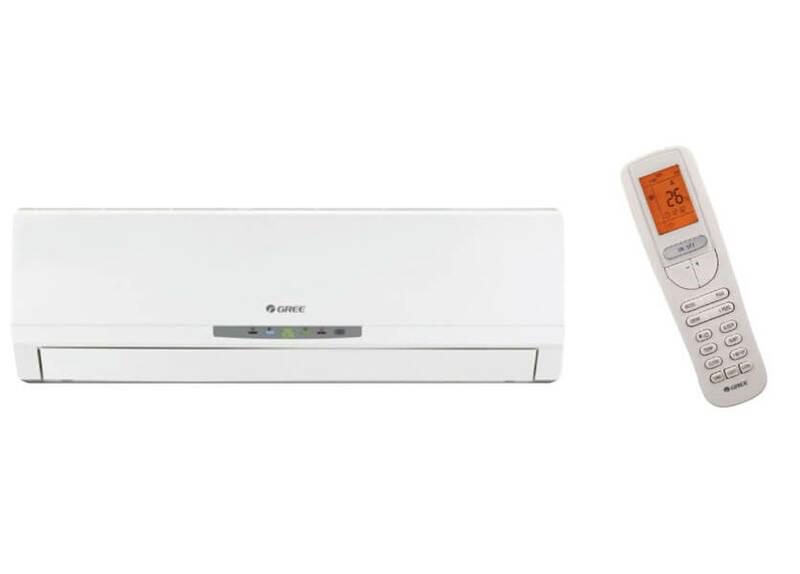 A/C Status: Indoor fan, outdoor fan, compressor and electric heat tube stop operation. 2 minutes later, 4-way valve stops; horizontal louver stops at the current position. The feedback terminal of PG motor is not connected tightly. The control terminal of PG motor is not connected tightly. Fan blade rotates roughly due to improper installation. Motor is not installed properly and tightly. Possible Causes: There’s no jumper cap on the controller. Jumper cap is not inserted properly and tightly. Jumper cap is damaged. Controller is damaged. Possible Causes: Controller is damaged. A/C Status: During cooling and drying operation, compressor and outdoor fan stop while indoor fan operates. 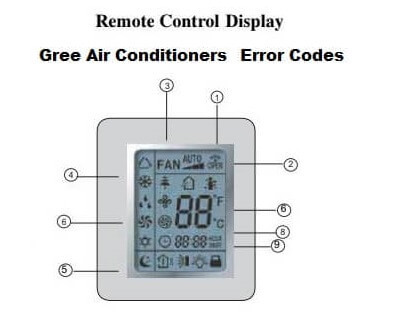 System is normal but the indoor tube temperature sensor is abnormal, or the tube temperature sensor is not connected well. The main board and display panel are not connected well. The LPP terminal on the main board is not connected well, with the high pressure switch on the complete unit. The wiring of the high pressure switch is loosened. High pressure switch is damaged or poorly contacted. Insufficient or leaking out refrigerant. The LPP input is at high level. Poor heat exchange (including filth blockage of heat exchanger and bad radiating environment ); Ambient temperature is too high. Possible Causes: Please refer to the malfunction analysis (discharge protection, overload). A/C Status: During cooling and drying operation, compressor stops while indoor fan will operate; During heating operation, the complete unit will stop operation. A/C Status: During cooling and drying operation, compressor will stop while indoor fan will operate; During heating operation, the complete unit will stop operation. Measure the voltage of position L and N on wiring board (XT), if the voltage is higher than 265VAC, turn on the unit after the supply voltage is increased to the normal range. 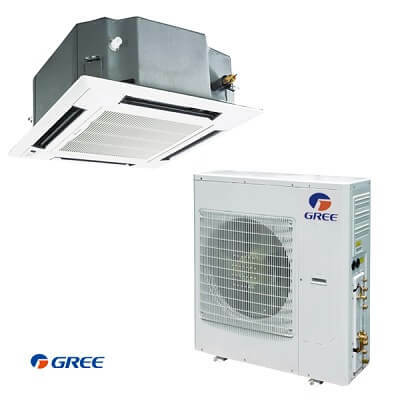 A/C Status: During cooling and drying operation, the compressor will stop while indoor fan will operate; During heating operating, the complete unit will stop operation. Possible Causes: There’s circuit malfunction on outdoor unit’s control panel AP1, please replace the outdoor unit’s control panel AP1. 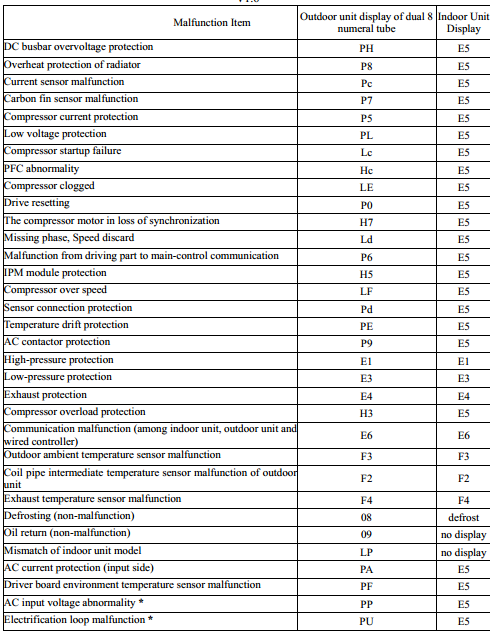 Possible Causes: Refer to the malfunction analysis (IPM protection, loss of synchronism protection and overcurrent protection of phase current for compressor. A/C Status: Defrosting will occur in heating mode. Compressor will operate while indoor fan will stop operation. Wiring terminal OVC-COMP is loosened. In normal state, the resistance for this terminal should be less than 1 ohm. Possible Causes: After the complete unit is de-energized for 20mins, check whether the thermal grease on IPM Module of outdoor control panel AP1 is sufficient and whether the radiator is inserted tightly. If it’s no use, please replace control panel AP1. Measure the voltage of position L and N on wiring board (XT), if the voltage is higher than 150VAC, turn on the unit after the supply voltage is increased to the normal range. Possible Causes: Discharging after the complete unit is de-energized for 20mins, check whether the thermal grease on IPM Module of outdoor control panel AP1 is sufficient and whether the radiator is inserted tightly. If it’s no use, please replace control panel AP1. A/C Status: During cooling operation, compressor will stop while indoor fan will operate; during heating, the complete unit will stop operation. In case of malfunction (such as bad smell), turn off the power immediately and contact the service center. * Do not repair the air conditioner by yourself. Incorrect repairs may cause fire. Please contact the service center. * The appliance should not be used by children without supervision. Once a failure occurs with the indoor unit in operation, the green unit LED flashes at intervals of 0.5 seconds. The fault code is deduced from the number of times the green LED flashes, blocking unit operation. Between one flash cycle and the next one, a pause of 5 seconds elapses. U7 4-Way Valve Malfunction/Bad Connection, Solenoid Failure, or Valve Malfunction. Water leaking from the indoor unit into the room. Cause: While it is normal for the system to generate condensate water in coolingmode, it is designed to drain this water via a condensate drain system to a safe location. The indoor unit is not level right to left. Level indoor unit. The condensate drain pipe is restricted or plugged.All restrictions must be removed to allow continuous drainage by gravity. Wireless remote controller does not work. The batteries might be low. Change the batteries. The remote controller must be within 25 ft. (7.5 m) with no obstructions of the indoor unit. If remote controller needs to be replaced,contact a qualified service professional for assistance. In the meantime, use the Aux Button to operate the system. Cause: There are a number of system functions that will prevent air flow. In heating mode, the indoor fan may not start for three minutes if the room temperature is very low.This is to prevent blowing cold air. In heat mode, if the outdoor temperature is low and humidity is high, the system may need to defrost for up to 10 minutes before beginning a heating cycle. In dry mode, the indoor fan may stop for up to three minutes during the compressor off delay. Moisture orcondensation on the discharge air louvers or outlet vents. Cause: It is normal for the system to develop condensation or moisture on the discharge air louvers when cooling warm humid air for a long period of time. Solution: The condensation or moisture will disappear as the system cools and dehumidifies the room space. Cause: The system has a built-in three-minute delay to prevent short and/or rapid cycling of the compressor. Solution: Wait three minutes for the protection delay to expire. Cause: Typically unpleasant odors are the result of mold or mildew forming on the coil surfaces or the air filter. Solution: Wash indoor air filter in warm water with mild cleaner. If odors persist, contact a qualified service professional to clean the coil surfaces. Cause: It is normal for the system to make“water flowing”or“gurgling”sounds from refrigerant pressures equalizing when the compressor starts and stops. Solution: The noises should discontinue as the refrigerant system equalizes after two or three minute. Cause: It is normal for the system to emit a slight fog or water vapor when cooling extremely humid warm air. Cause: There are a number of situations that will prevent the system from running. Power button of remote is not turned on. Batteries in the remote controller are low. Remote controller is in sleep mode or timer mode. Cause: While it is normal for the system to generate condensate water in cooling mode, it is designed to drain this water via a condensate drain system to a safe location. Solution: If water is leaking into the room, it may indicate one of the following. What does this indicate ? I have gree DC inverter the outdoor unit was at the roof it was laid after a cyclone but it was working there is no gass leaking but now outdoor unit is stopped after a minute I have replaced out for PCB but is same before what do I do ? I have a problem with my gree ac, few minutes after turning on it displays error F2. I have a 1200 square foot gree mini split showing a U7 code coming up on the indoor unit. how do I repair this? Cassette Ac O. General 2ton indoor unit green light red light blinking what problem. We keep getting a code of oE on the indoor unit display. It shuts the unit down and then it will work later. I don’t see this code in the manual. What is it? Thanks. I have gree 12 btu he work properly on heat mode but after h1 defrost I loose the hot air whats the problem? What is J9.. what is the meaning and what is the solution for that..
How to convert the temperature displayed farenheight to centigrade in remote unit? F2 show on indoor LED, what should i do? I have an F0 error code. I have read as much as I can and still will not get cold. What do I do? Just bought it today. 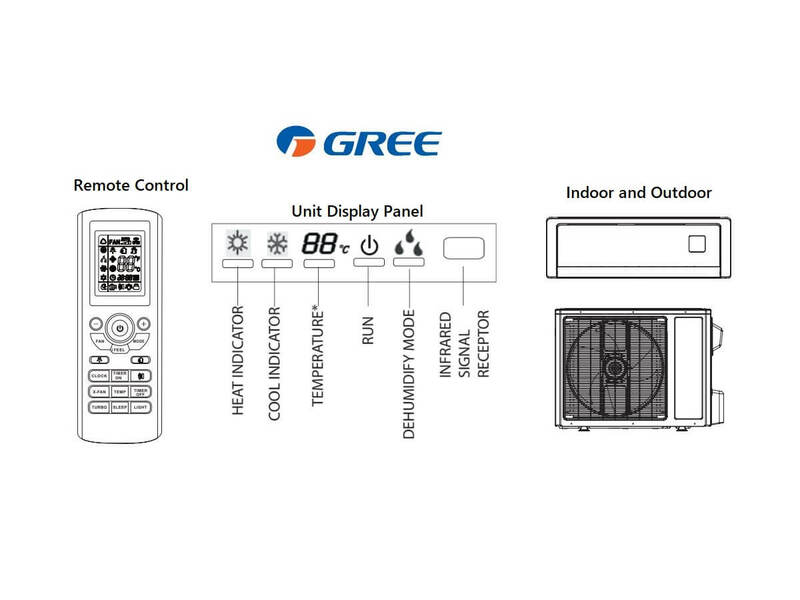 I have gree 18000 btu inverter air condition error corde H7 pls tell me solution. I have gree 18000 btu and showing PH error. How to fix it ? please help!!! I got 2 installation of gree inverter 1 is working ok and second one is not working.its indicates LP.all connection is ok.can’t find the trouble.please help. How to fix f2 error? 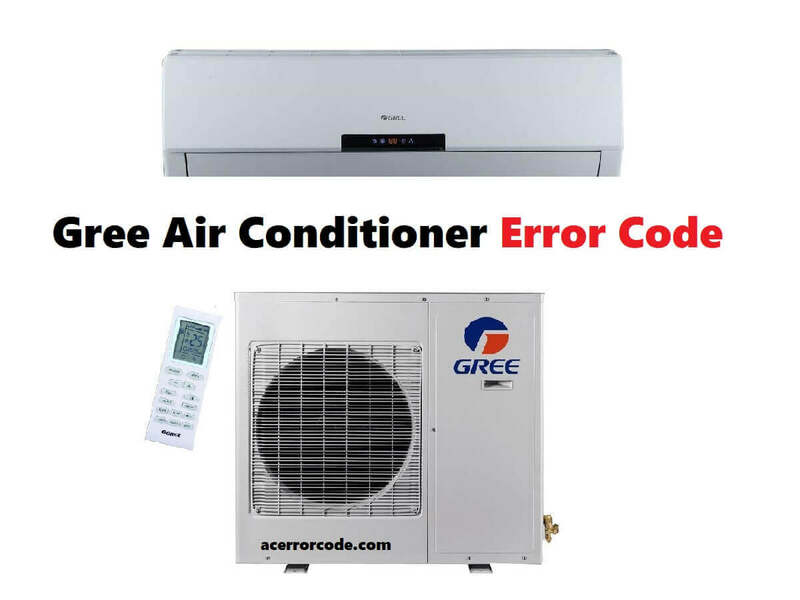 Gree ac air-conditioning 18,000btu compressor fail to start. Request what cause failure to compressor not to start. 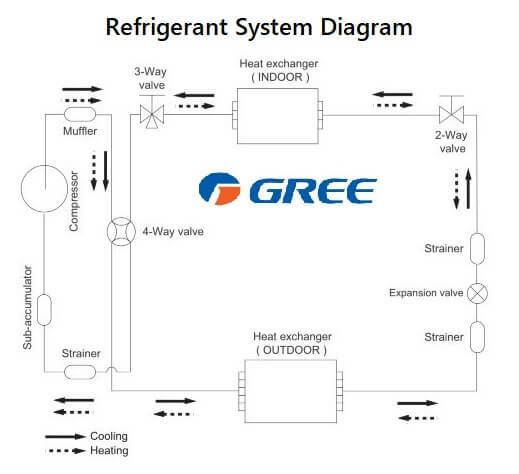 I have a gree heat pump with a door malfunction (fc) , how do I fix it ?